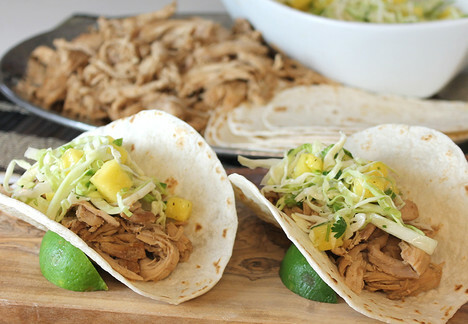 A tasty slow cooker pulled chicken served alongside a sweet and spicy pineapple slaw. For the chicken: In a slow cooker, add soy sauce, honey and garlic. Stir until honey is dissolved. Add chicken and coat in sauce. Turn slow cooker on high and cook for 2 hours. Turn chicken and continue cooking another 2 hours. For the slaw: In a large bowl, combine pineapple, cabbage, green onion, cilantro and jalapeno. In a separate medium bowl, whisk together apple cider vinegar, olive oil, honey, salt and pepper. Toss with cabbage mixture and refrigerate. Transfer chicken to a large bowl. Discard bones and shred the meat. Keep warm. Strain the liquid into a small saucepan. Cook on high until reduced by half. Toss with shredded chicken. Serve chicken alongside slaw and your favorite tortillas.